When cooking – Nothing is better than using the freshest ingredients possible. Most of us don’t have the luxury of homegrown meat, for that you will need to visit a good butcher or fishmonger, but we can grow our own fruit and vegetables. Whether you grow just a small amount in your garden or upgrade to an allotment – for at least a few months of the year, you can enjoy fresh salad, potatoes and almost anything else you feel like growing. I must confess, I don’t actually grow anything. I am lucky to have family members that do the growing for me. ‘Been There Dug That‘ is a blog by a family member about the development of her allotment. The progress has been incredible and already we are enjoying the fruits of her labour. 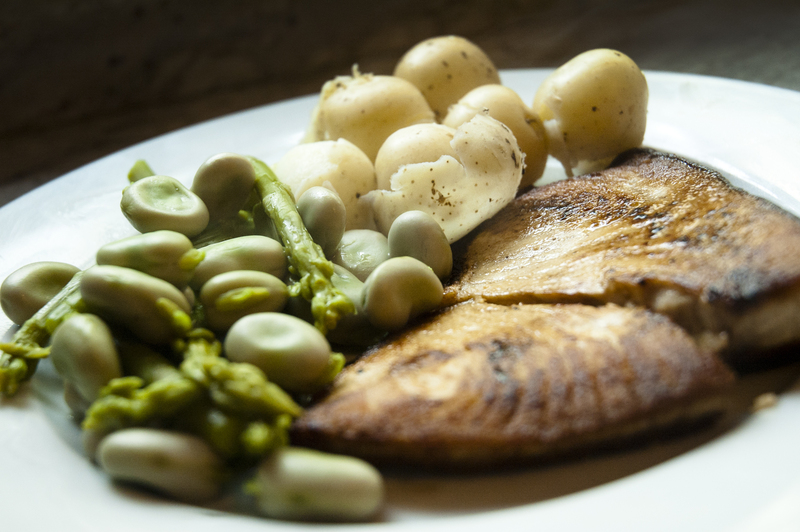 Most recently I enjoyed the wonderful vegetables from the allotment with a beautiful piece of swordfish. Swordfish is my favourite fish. With its meatier texture and brilliant flavour, simply pan-fried with a little butter, it’s perfect. I don’t necessarily see the need to over complicate the rest of the dish. Especially with ingredients as fresh as the ones at my disposal. So far we have enjoyed everything from strawberries and cucamelons to potatoes, peas and broad beans. What are cucamelons? Cucamelons are a tiny fruit that look remarkably like watermelons but taste more similar to cucumbers. It has a slight tangy flavour but definitely worth a try. Apparently they are actually quite easy to grow, so if you have the space… why not? Even if it is just to make the kids feel like giants. For those of you with children – they love gardening and growing their own vegetables. I can guarantee, if your children won’t eat vegetables bought from the shop, they are far more likely to eat vegetables they have helped grow and pick themselves. My daughter loves it! Going up to the allotment is one of her favourite things to do, especially if there are strawberries. These strawberries were incredible. Proper British strawberries – the texture was different to those bought in the shops, but the flavour is far superior. Much much sweeter, the supermarket versions tasted bitter in comparison. There are obviously other benefits besides better flavour. The fruit and vegetables you use could be organic because you have control over how it is grown. It can actually be cheaper over time if you know what you are doing. You may even benefit from a little exercise whilst gardening. Personally, better tasting food is the biggest advantage of growing your own fruit and vegetables and will always be my primary motivation for growing my own fruit and vegetables in the future. I urge you to have a go, or at least convince a family member or friend so that you can reap the benefits like I have. 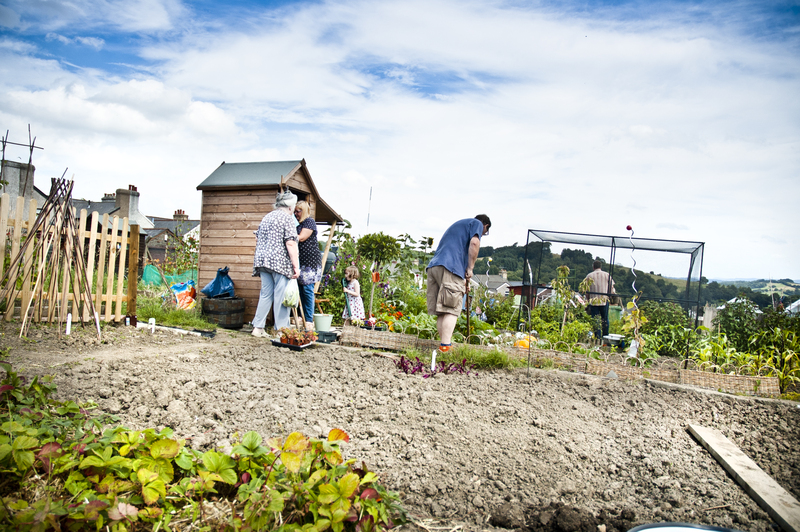 Here are a few photographs from a typical day at the allotment. Previous PostCooking: Whisky Beef Burgers with Red Onion Chutney.Next PostHang Fire Smokehouse Announce Cookbook Deal! Thank you for the mention…and you’re very welcome…as long you you’ll do the cooking !